I would like to change the \newcommand \shcpoint into an xparse \NewDocumentCommand. How can I achieve this? My question then extends to: Is there something equivalent to \addtocounter, \ifnum, \else and \fi in LaTeX 3 syntax? When a command defined with \NewDocumentCommand does more than can be implemented with user level commands, it should call a programmer's level function. Since we want to enter the programming environment, we need to issue \ExplSyntaxOn. 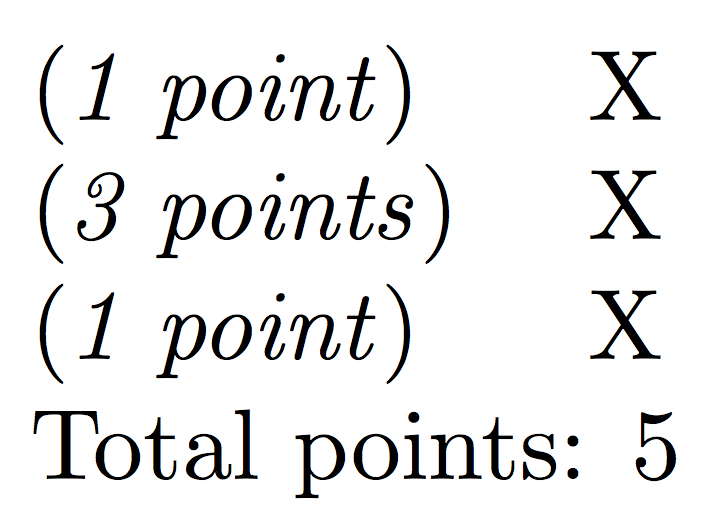 Since your counter totalpoints is used to keep track of the points and not for typesetting values other than at the end, I declare it as an integer (global) variable. I define also the command for printing the variable's value; since it uses just one internal function, it's not necessary to define our own internal. In the programming environment spaces are ignored (unless they are syntactically meaningful for separating command names), so a space in output is usually denoted by ~. The internal function has one argument, so its name ends in :n.
\azetina_shcpoint:n is “protected” because it performs an assignment. omitting the false case if nothing should be done. 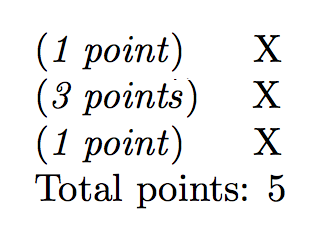 Here we measure the text with the “s” (assuming that the number of points per question is less than 10 and using 0 as the default width for the digits) and typeset the final result in a box of the correct width. If you try with \showoutput, you can see that all the relevant boxes have width 42.7429pt. The current expl3 programming layer is really aimed below this, so \addtocounter is fine I think. However the code doesn't do what I guess is the intention of setting point or points to the same width. Also it should be using \textit (or better \itshape) rather than \emph. Where you can see the difference is the different \kern which is the italic correction (added by \emph) for s and t respectively. You would see an even bigger difference if the trailing command had been . rather than \quad as then the italic correction would be suppressed in the first case but not the second. But that relies on there being no kern specified in the font metrics between t and s.
Not the answer you're looking for? Browse other questions tagged latex3 xparse or ask your own question. How can I create an oddly-delimited macro, using xparse? How do I pass an expanded optional argument using expl3/xparse? When using \IfEq to compare strings, is it one of those times when I should use an expandable xparse command?